1. Countess Eleanor BRANDON, daughter of Charles Brandon, Duke of Suffolk (1484-1545) and Mary TUDOR (1496- ), was born in 1519. She married Henry CLIFFORD in June 1535. She died in 1547. 2. Charles Brandon, Duke of Suffolk, son of Sir William BRANDON and Elizabeth BRUYN, was born in 1484. He died in 1545. He married Mary TUDOR. 4. Sir William BRANDON, son of Sir William BRANDON and Elizabeth WINGFIELD, married Elizabeth BRUYN. 6. 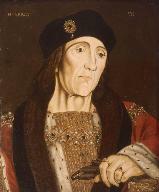 Henry VII KING OF ENGLAND, son of Edmund Tudor 1ST EARL OF RICHMOND and Margaret BEAUFORT, married Elizabeth of York in 1486. He died in 1509. Henry VIII KING OF ENGLAND ( -1547). Henry married Katherine of Aragon in 1509. He married Anne BOLEYN in 1533. He married Jane SEYMOUR in 1536. He married Anne of Cleves in 1540. He married Katherine HOWARD in 1540. He married Katherine PARR in 1543. He died in 1547. Arthur TUDOR ( -1502). Arthur died in 1502. Margaret TUDOR (1489-1541). Margaret was born in 1489. She died in 1541.